What the heck, let’s get this party started. *if you guys and gals have other good resources you’d like me to add to the OP, please post them. Started a rough draft of the garden. I decided on 12’ x 24’ to start out with. But I have plenty of yard at the new house to go much bigger, so that may be an option in the future. My previous garden at the old house was 14’ x 14’, so I’m already almost 100 sq ft bigger than last year. There’s lots of work to be done including soil testing and working the dirt. Each box on the grid paper is 1 sq ft. The plants are subject to change. Right now I’m trying to decide what I’ll actually use regularly and what I’ll can. I don’t want to grow stuff just for giggles and then end up wasting it or trying to give it away. 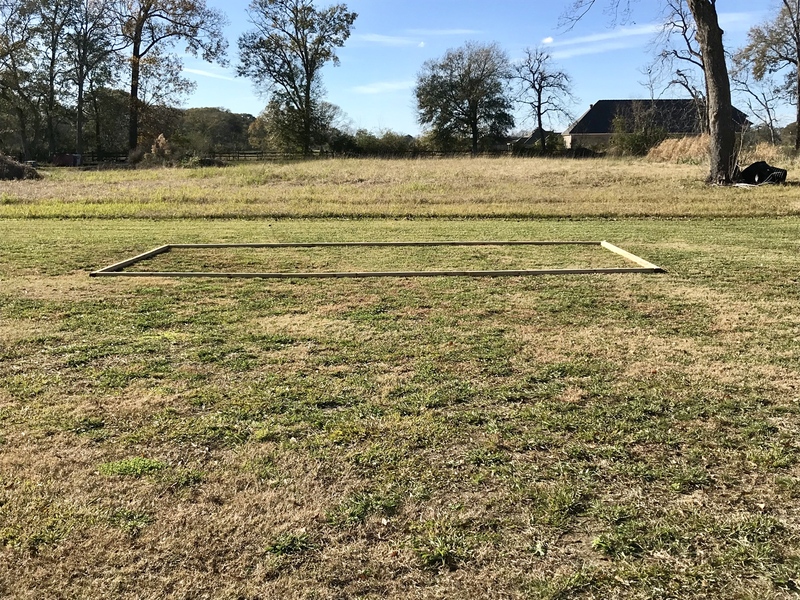 I’ve picked out the spot in my back yard, framed it up with landscaping timber, sprayed the grass, and measured and marked the rows (although that was after this pic was taken). I need to start purchasing seeds and trays. So I’ll need to make some decisions pretty soon as to what to plant. The three rows of tomatoes in the rough draft are pretty set in stone. Carmen peppers and green bells also, but the quantity may change. I will definitely do okra, but haven’t decided what kind. Recommendations very much welcome. I’ve also already started to gather other supplies like mulch, peat humus, compost, and other stuff to build up the soil. I’m going to test first, but I already know that I have some clay soil here. I’m excited! I can’t wait to start playing in the dirt. One less row of maters and make it one more of okra. Will still have plenty maters to give. What kind of yield can I expect from okra? This will be my first time growing them. I may do that with the tomatoes, but I use the hell out of tomatoes for canning. I had 12 plants last year and wish I would’ve done more. Winter garden is still coming along slowly. I only have broccoli and cauliflower but it's growing slowly. They really didn't take off until it got colder. Not sure if they will produce but we shall see. I have a 4x12' raised bed, a 1x8' raised bed/box, and a 16"x8' box on my fence. This is the plan for my 4x12' per square foot method. Soil is 1/3 peat moss, 1/3 compost blend, an 1/3 vermiculite. I haven't figured out what I'm going to put on the far right (south) side in the last 8sqft. Probably okra. Going with lots of peppers of these varieties: Carmen (huge fan of these), Corno di Toro Giallo, California Wonder, Gold Marconi, Jimmy Nardello, Poblano, Jalapeno, and Hungarian Hot Wax. I grew Jimmy Nardellos, Carmens, Shishito, and Big Bell this fall. Everything did great except the Bells. I didn't find much use for the Shishito peppers and grew far too many of them. I'll probably down size to one plant in my fence box for the spring just because each plant makes like 100 peppers at a time ha. I'm gonna start all my pepper seeds here in a week or so, except for jalapeno/Hungarian hot wax just because I can get those at the co op. On the left I'm going to give straightneck squash another go in cages, even though the vine borers got my plants last spring. I'm gonna grow two Tiger Zucchini plants as well (in cages). They're pretty cool looking. I grew 6 Mohawk plants in my fence box and they did great. I'll be growing those again, in addition to a couple of Redskin plants. These plants stay pretty small so they're nice for a compact spot like my fence box. The Mohawks were really prolific too. I'm growing two tomatoes (Celebrity and Fred's Tie Dye) in the raised bed as you can see in the photo, but the rest of my tomatoes will be in grow bags. I'm growing sweet million, Sungold, 2x Cherokee Purple, Purple Bumble Bee, and Large Barred Boar. I think I'm going to put a Sarandipity dwarf plant in my fence box. This fall I grew two Sweet Million plants, one sweet 100, one Celebrity, one Better Boy, and three Cherokee Purples. All did well up until the middle of November, then I just kinda let them go with the cold and picked everything green. Most ripened. I prefer the size of the Sweet Million tomatoes over the Sweet 100s, so I won't be growing the 100's again. My 1x8' raised bed/box will be all cucumbers. Growing two per hole at 12" spacing. Half will be Sweet Success variety and the other half is going to be a self-pollinating pickling variety called Masha that this guy recommends on YouTube. Pillage you probably remember, but the spring was my first shot at this. I had A LOT more success in the fall than the spring. Currently I have lettuce, chard, graffiti and cheddar cauliflower, and two types of broccoli going. I also planted out my entire fence box with cosmic purple carrots. Gonna pull them whenever I plant the box with my spring peppers in about 3 months. I won't be growing any spring broccoli or cauliflower though. I'm just going to focus on starting the seeds. Anything else is more work than I want to deal with. You will be picking at about 1 pod per plant per day when they are going full bore. I usually plant 60-70 okra plants every spring and by mid summer I'm picking 60-70+ pods a day from them and one day I picked over 100 pods. I see you are planting cucumbers and beans. Direct sow them into the ground instead of using starter pots and plant then thick to thin as needed. Same with okra, they can grow no more than 12-15 inches apart even though they do get huge. And speaking of huge, like 8+ ft. tall by seasons end====plant then on an end row and not in the middle of the garden unless your sun crosses the row in line with it and not across it and also direct sow them into the ground too. They don't tend to transplant very well and get stunted a bit as opposed to putting the seeds in the soil from the get-go. 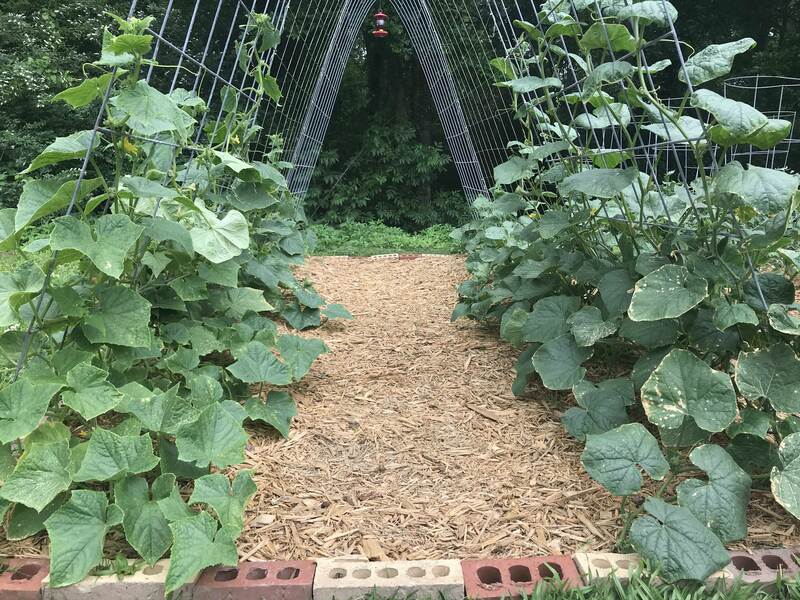 Also with cucumbers, they work great on a trellis but on the ground they take up lots of room and the cucumbers don't fare as well lying on the soil. Plus they are easier to pick when they climb. As for beans, bush type produce more, but are shorter lived than pole beans, and again, they love to climb on a trellis----pole beans that is. If you've never grown them, give Japanese Yard Long beans a shot. They grow fast and produce beans 2+ ft. long that smother down very nicely, but don't can in a brine worth a damn in my experience. They are also known as Asparagus beans and are also great on the grill. Cut them in 6 in. lengths, drizzle with olive oil, sprinkle sea salt, pepper and garlic powder and grill like any other vegetable. Oh, and grilled okra is the bomb. Same way as the beans and everybody that has tried it loves it. My yard is heavy clay. I've amended the garden over a period of several years and have better soil, but the clay is still a problem. I'd suggest that you add peat hummus and gypsum, and possibly sand and other organic matter, and turn it in as deep as you can. A good tiller will help with this. The first few years I did this, I turned mine with a shovel to get down into the clay layer prior to tilling. Stop by Lowe's or home depot and buy busted bags of peat for half price. I think l had to get the gypsum at the co-op. It will take a lot of both...buy more than you think you need. My garden also gets 3-4 yards of mulch every year, which adds more organic matter to the top layer. If I had to do it over again, I would do raised beds and bring in new soil with a gravel base to increase drainage. Probably would've been cheaper, easier and more productive. Pillage you probably remember, but the spring was my first shot at this. I had A LOT more success in the fall than the spring. I remember. I'm going to take a lesson from my dad who always seems to have a ridiculous tomato crop every year. He plants in February. He said if there is a late frost he just covers them. But by the time the heat, bugs, and disease kicks in his plants are usually almost done. With age comes wisdom. I see you are planting cucumbers and beans. Direct sow them into the ground instead of using starter pots and plant then thick to thin as needed. Yep, that’s how I always do it. This was my setup last year. Doing it like this again this year. Cattle panel FTW. I don’t know if I want that much okra, but that’s good info. Thanks! Same with okra, they can grow no more than 12-15 inches apart even though they do get huge. And speaking of huge, like 8+ ft. tall by seasons end====plant then on an end row and not in the middle of the garden unless your sun crosses the row in line with it and not across it and also direct sow them into the ground too. They don't tend to transplant very well and get stunted a bit as opposed to putting the seeds in the soil from the get-go. Also great info. Thank you. That picture in the OP is facing the west. The sun will pass directly over the entire garden. Everything will get plenty of sun. I definitely thought hard about that when picking the spot. re: 2019 Garden ThreadPosted by gumbo2176 on 12/27/18 at 2:00 pm to Bill Parker? I've got serious amounts of clay in my yard. The first time I tilled it, I could only get about 3 ft. and had to stop and scrape the tines. Years of adding organic matter in the form of tons of grass clippings, oak leaves, composted manure, etc. have made my garden nice and rich with very loose soil. 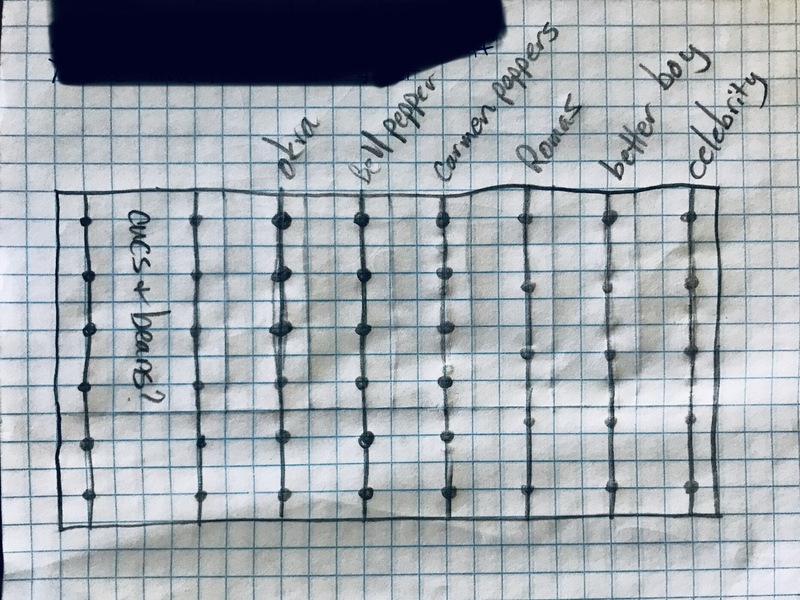 I do till deep and I now have 5 rows 50 ft. long with a raised bed that is 4 x 12x1 ft. deep for root crops like garlic, beets, carrots and turnips. I also have 3 large trellises that are 16+ ft long x 6 ft. tall for cucumbers and pole beans. re: 2019 Garden ThreadPosted by PillageUrVillage on 12/27/18 at 2:00 pm to Bill Parker? Mine isn’t that bad. But there’s definitely a good bit of clay in the dirt. Stop by Lowe's or home depot and buy busted bags of peat for half price. I did that this past weekend. Already picked up a bunch. The cashier didn’t look too happy to have to punch a few extra buttons in the computer. ETA: I will be buying a lot more though. My house is built on top of old sweet potato farm land. Then it was horse pasture for a little while before they started developing it. The dirt here is great. But, the dirt they brought in to turtle back the property has a good bit of clay in it. I imagine once I break up the first couple of feet, there's good dirt under it. They are building a house across the street from me, and when they started digging and moving dirt around it is really beautiful topsoil. I might see if they can give me some. Have any of y'all tried planting two pepper plants per hole? I saw a guy on YouTube who swears by it. He says your production per plant is down, but not enough to offset the extra production for having two plants in the same spot. What kind of yield can I expect from okra? 1 to 4 pods per plant every 2 or 3 days. What varieties of okra are your favorite? Cow horn was recommended to me. I may do more than one. What varieties of okra are your favorite? I've been planting the same variety a friend gave me seeds to, for the last 6 yrr. I save seed from it. ahe said it was called "Fontenot Okra". : Seriously. I'm going to plant a different ont this yr that is more of a bush type. This one was but is getting taller. I guess even the okra inbreeding has hurt the Fontenot okra. I saw you in the deer fart thread and was just about to ask you about your garden. So you're liking the Carmen peppers? Those things are great. Can't wait to see your new garden! So you're liking the Carmen peppers? Never had one. But you talk so much about them I figured I’d grow some this year. Moving back to my hometown after college and my dad has some land that I'd like to use to start a garden to keep myself busy.